I was in the West Bank, in the middle of a 9 day Nonviolent Communication training, on Inauguration Day here in the US. Day after day, for 9 days, I sat with up to 100 Israelis, Palestinians, Germans, Americans, people from many other countries, celebrating, mourning, questioning, sharing heartfelt longings, expressing anger, fear, love, confusion. Some days i felt overwhelmed with the depth of connection to everyone else in the room, to the shared fears and outrage and love and hopefulness. Some days i felt excruciatingly lonely, as I sat in the global community and was focused on mourning my mother's recent death and dying. And everyday, I returned to the group, to hear and to harvest together our individual and collective celebrations and mournings and insights. One evening, i invited anyone so moved to join me for my mother's shloshim- 30 days after her passing. The room filled with Palestinians, Israelis, Europeans and Americans, and I felt so blessed to share my Jewish tradition's ritual mourning with Jews, Moslems, Christians and Buddhists; to remember my mother amidst this outpouring of global love was an experience of touching our shared humanity in a new and deep way. One day i sat with young Palestinians whose tears flowed from their eyes as they shared the experience of feeling such deep connection to and compassion for the Jewish people who they were meeting there. I meditate everyday now on the wisdom I heard from participants- from a Palestinian elder, "pain has no identity." From a representative of the Bereaved Families, " our pain is our greatest strength." And from the trainers- " Our idea in NVC of honesty isn't someone telling me what's wrong with me." And that NVC consciousness means that I want to speak and act in a way that shows that everyone's needs matter. I came away with a deeper seeing of myself- how self acceptance is always the key to my inner peace and happiness and energy to act in the world. i came away with a deeper knowing that my happiness and freedom and effectiveness in the world are strongest when I live in the consciousness of everyone's needs mattering equally and fully. I want to bring these experiences here to our own country, to bring together neighbors and communities where connecting across divides is not just scary- honesty can often be scary- but also deeply fulfilling for our individual and collective lives and futures. I feel so grateful for the practices of NVC and Mindfulness, and the teachers and friends who guide and accompany me on the path of compassion. 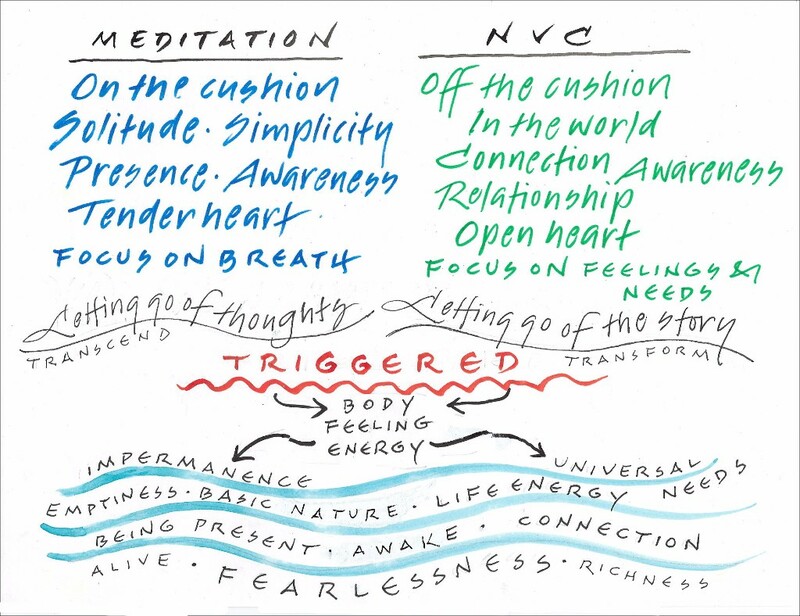 For a deep, exciting journey into the intersection of Buddhism and NVC, beginning April 5, join this on line course with me and Barbara Bash. Info and register here. In or near Raleigh, North Carolina, a weekend NVC immersion May 20 & 21. Info and register here. Roberta Wall was a civil rights lawyer in NYC and a mindfulness practitioner and coach. She is a certified trainer in Nonviolent Communication. She has led trainings and retreats in Compassionate (Nonviolent) Communication and Mindfulness on five continents, focusing on the Mideast, and has been the recipient of numerous peace fellowships. In Asheville, NC she has recently joined the Board of Congregation Beth Israel, participates in the Thich Nhat Hanh Buddhist meditation community, and participates in human rights movements. Calligraphic journey by Barbara Bash in preparation for our upcoming on line course NVC and Buddhism. In the upcoming opportunities to learn, live, and practice Nonviolent Communication (NVC) , I hope we will have the experience of passion and engagement and truth without judging, blaming, hating or demonizing. Whether it’s within our families, workplaces, communities, or between peoples of different cultures, faiths and beliefs, NVC can strengthen our advocacy and communication and help us transform blame, anger and hatred. As we move past the elections, let us step forward into being the change we want to see in the world. A world where everyone’s needs are valued and celebrated. Copyright © 2017 Steps 2 Peace, All rights reserved.